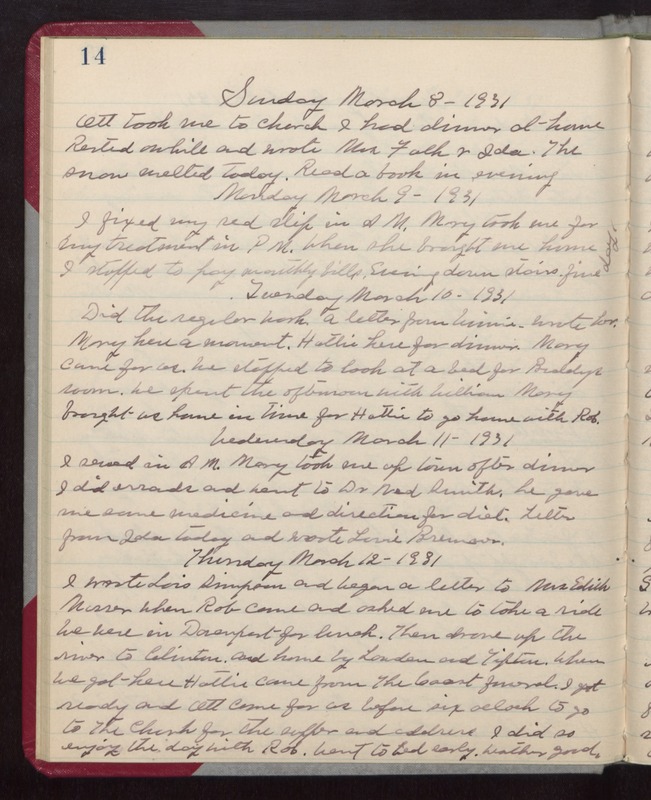 Sunday March 8- 1931 Ott took me to church I had dinner at home Rested awhile and wrote Mrs Falk & Ida. The snow melted today. Read a book in evening Monday March 9- 1931 I fixed my red slip in A M. Mary took me for my treatment in PM. When she brought me home I stopped to pay monthly bills. Evening down stairs. fine day. Tuesday March 10- 1931 Did the regular work. a letter from Winnie. Wrote her. Mary here a moment. Hattie here for dinner. Mary came for us. We stopped to look at a bed for Buddys room. We spent the afternoon with William Mary brought us home in time for Hattie to go home with Rob. Wednesday March 11- 1931 I sewed in AM. Mary took me up town after dinner I did errands and went to Dr Ned Smith, he gave me some medicine and direction for diet. Letter from Ida today and wrote Louie Bremner. Thursday March 12- 1931 I wrote Lois Simpson and began a letter to Mrs Edith [Musser?] when Rob came and asked me to take a ride We were in Davenport for lunch. Then drove up the river to Clinton, and home by Lowden and Tipton. When we got here Hattie came from The [Coast?] funeral. I got ready and Ott came for us before six oclock to go to The Church for the supper and address I did so enjoy the day with Rob. Went to bed early. Weather good.